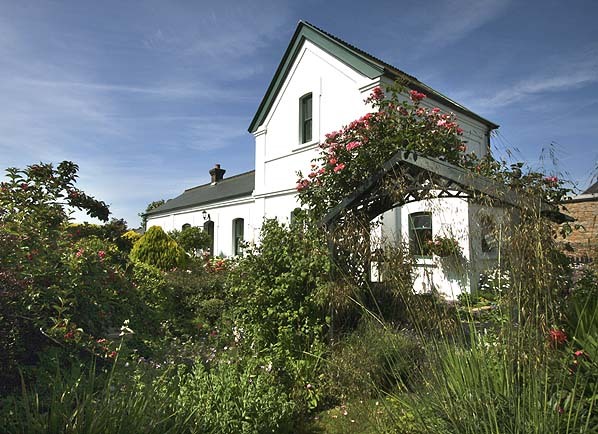 Present state: The station building survives in good condition and is now a private residence. The trackbed has been filled up to platform level to make a garden. One side of the booking office window survives in the bathroom of the house. 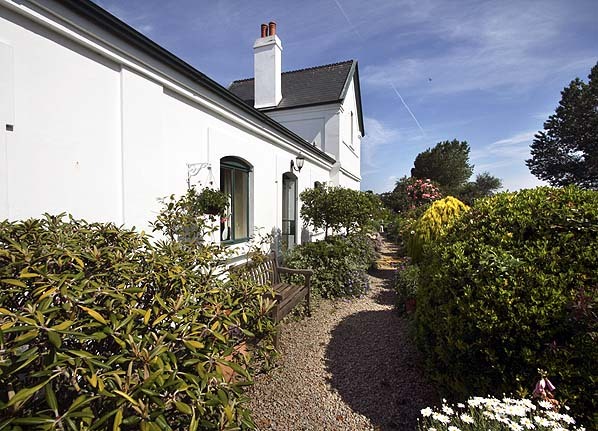 Notes: When the Jersey Eastern Railway opened on 14th August Grouville was the eastern terminus until 27th August 1873 when the line was extended to Gorey. 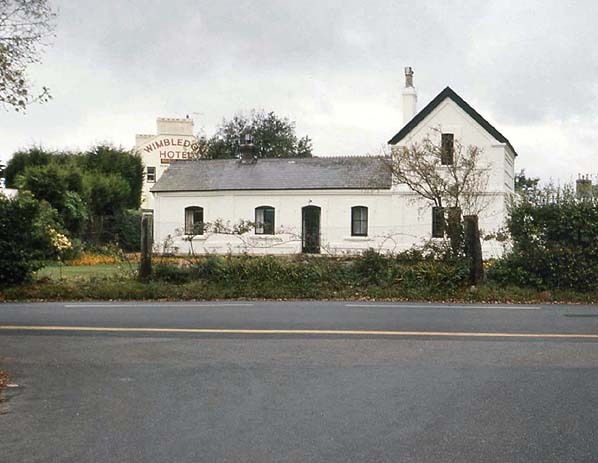 Initially the station was incorrectly called Wimbledon after a nearby hotel (visible in the 1973 picture below) but this was quickly rectified. Grouville was provided with a passing loop and a second platform, both platforms were 225 feet in length. 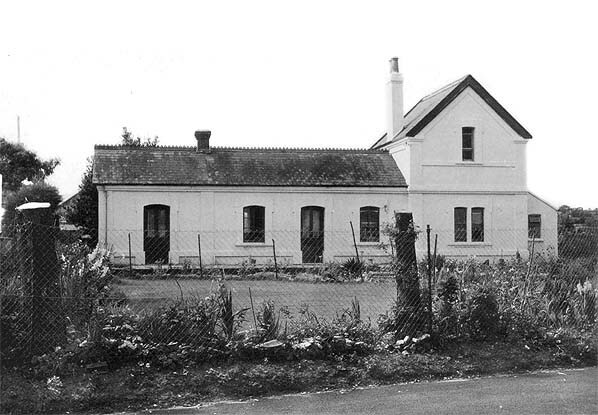 The main station building was on the down platform and was of similar design to other stations on the line with a single storey booking office and waiting rooms and an adjacent two storey stationmaster's house on the down platform and a small waiting shelter on the up platform. There was a short siding on the down side to the south of the station but when the expected goods traffic never materialised this was quickly lifted. On most days trains only used the down platform, the up platform only being used during busy periods when there were two trains in steam. 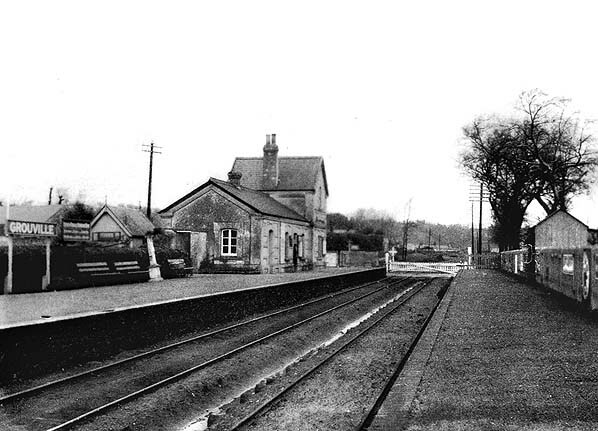 The station was particularly busy on race days, the islands horse racing course was on Grouville Common until 1878 when a new course was opened at St. Brelade; the loop was then rarely used..
to investors during this period, debenture interest was paid in 1876/77 but not again until 1881 or later. too late to arrest the downturn. 1926 was a very bad year for the company which made a net loss of £853, although it still paid a dividend taking money from the reserve fund. large fleet of requisitioned lorries. To aid this transport, the Germans began constructing a line from Gorey to St Helier in March 1942. This was built on the track of the JER between Grouville and Pontac then followed the main road to Le Hocq to rejoin the JER to Grève D'Azette, where an engine shed was built. Following the liberation of Jersey on 9th May 1945 this track was quickly removed. 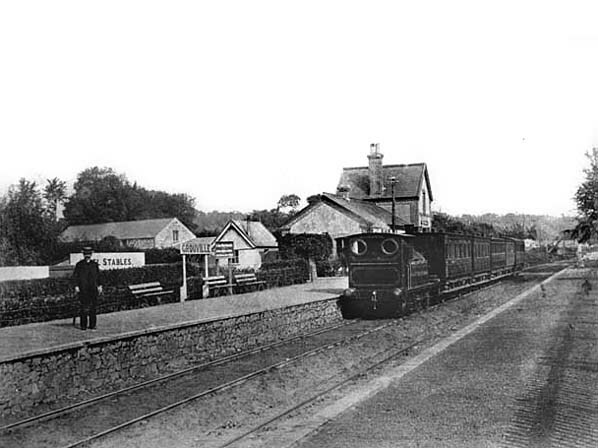 Grouville station looking north from the up platform in 1925. By June 2010 the station building has been extended and altered although the original building with its porch can still be seen.